Newly redesigned ATV fairing with a curvaceous & extra-wide fiberglass lower section. Color matched to the latest ATV's. The shield is made of polycarbonate and is tough and distortion free. Mirrors are convex for wide vibration free vision & feature a strong base & tension adjustment. Hardware included. AU-MT718509 Metallic Green, with headlight cutout Polaris, Sportsman 500 H. 02O. Protects rider from wind, rain, insects and branches. The windshield is constructed of tough, shatter-resistant .080 polycarbonate. Will bend, but not break. The entire windshield is trimmed with a round plastic molding. The hardware is made fo stainless steel strips which go across the windshield, with polyester powder painted steel brackets. The hardware is designed to fit all ATVs. 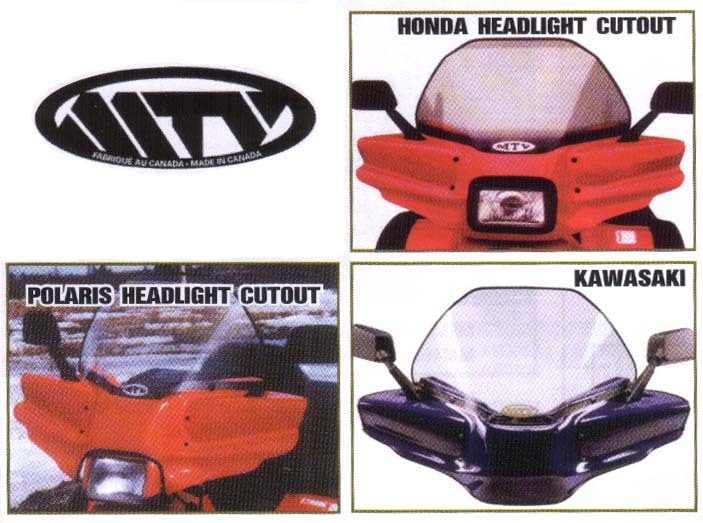 Available with or without headlight cutout - make your choice below. TV windshields just took a giant leap forward! This windshield is twice as thick as some competitive models, offering unmatched strength and durability. It offers full coverage for excellent protection from the elements. The Cobra offers our exclusive four-point mounting system for great rigidity. Heavy-gauge polycarbonate plastic is used for great durability. For rider safety, the Cobra ATV windshield features a break-away design which protect the rider from injury while offering a convenient quick-detachment system. Universal fit. Choose from 3 styles below.